The room feels claustrophobic, with people crammed everywhere, in a room that feels like despair and depression. There is a long line of standing bodies waiting to stare at the open casket behind me, so when they reach me they can hug me with words of solace. Except I don’t feel solace, I don’t feel peace. I feel like screaming and punching my way through the packed crowd. I’m at that breaking point, when I look and see who is grabbing my hand—my best friend, my un-biological sister. She knows, she feels my panic growing, too. I’m not sure what she says to the line, but I’m being pulled away by her gentle hands and set smile. 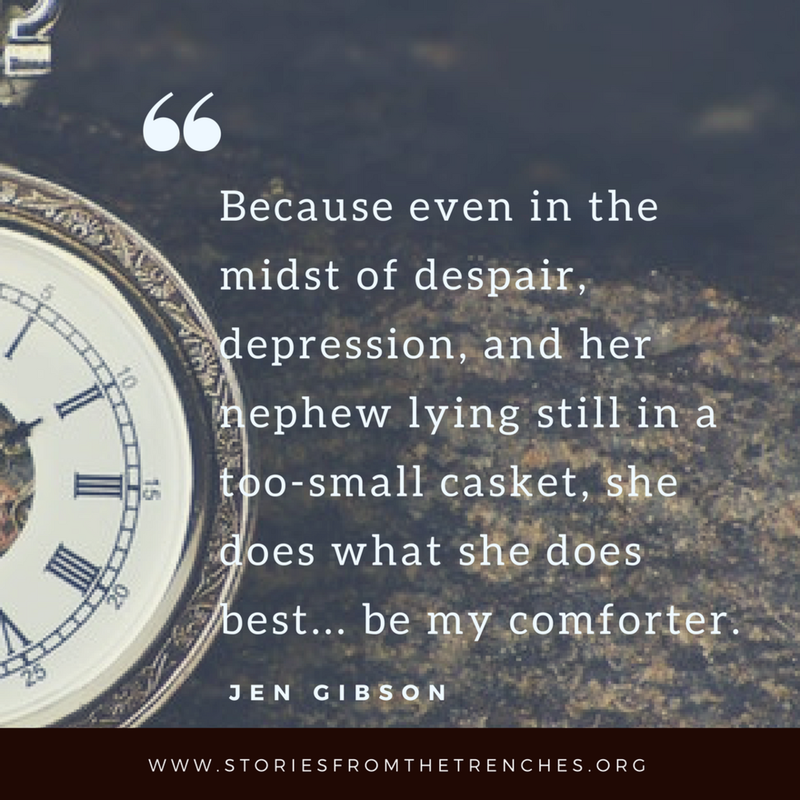 Because even in the midst of despair, depression, and her nephew lying still in a too-small casket, she does what she does best... be my comforter. The Jens first High School Homecoming together. I was excited and anxious on the first day of freshman year. Only a fourth of students from my middle school went to this high school, so I wasn’t sure about meeting new people. I bumped into Jennifer before the bell even rang. Our lockers were conveniently located right next to each other (well, almost next to each other—there was one girl between us). We had attended different middle schools, so were complete strangers who just happened to have lockers next to each other. Both our last names started with Ca. We also had almost every class and lunch together. We realized quickly that we had so much in common—and she was an only child, too. It wasn’t long before we began to be attached to the hip, both in school and out. Our other friends referred to us as “The Jens”, and sometime that first year I began calling her “My Twin”. What attracted me to My Twin is what still holds me today. She is so many things that I am not. She is sweet, kind, generous, warm, soft, loving, and loyal. I often joke that “Jennifer is the softer side of Sears,” because she is the softer, gentler version of myself. I’m outgoing, but nowhere close to her. She knows everyone and can rattle off goings-on with each of them. Her smile and easygoing personality are infectious, and she is loved by many. I have yet to meet someone that knows her or has even met her and has an unkind word to say about her. Her front door is usually unlocked, proving her warm welcoming attitude. There are always comings and goings from her home, which shouldn’t be surprising, then—it is also my second home. A place of comfort and warmth. The same place where we spent many a school night curled on her couch watching chick flicks, eating popcorn, and sharing gossip. Her home, like her, keeps me feeling centered. New Christmas tradition, spending a day in downtown Chicago together. I am lucky to have such an amazing best friend, twin, and sister, and that is really my reason for surprising her with these words. 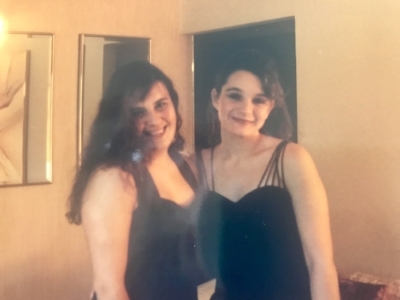 Also, this year marks 25 years of friendship. We never guessed that locker assignment would lead us to marriages, our own children, family dinners, holiday celebrations, and even family summer vacations. She is my first phone call for every emergency, or even just to say hi. Her home is the family home I run to when my heart is racing, or when I need to put my feet up. I’ve lost track of the number of times I’ve crashed on her couch. I am Aunt to her children, as she is to mine. Our husbands are in some kind of bromance, and we try to sneak away for double dates as often as possible. 25 years later and I can honestly wholeheartedly say: Jennifer is my home, my moral compass, and my True North.